Dementia and alzheimer’s are often thought of and discussed as one and the same thing when, in fact, they are different. However, although they are different, they are similar in the sense that neither one is considered normal as it relates to the process of aging. Here are the ways in which the two differ. Dementia is not a disease – it actually refers to group of symptoms, including memory loss and difficulty with reasoning, problem-solving, and language. 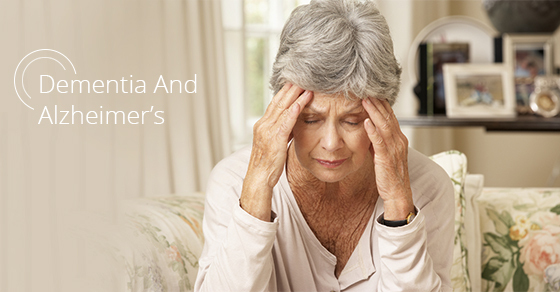 It is common for people to have multiple conditions that result in dementia. In other words, when someone is diagnosed with dementia, they are actually being diagnosed with a set of symptoms. Early signs of dementia include forgetfulness or failing to remember how to get around a place that was once familiar. As dementia progresses, people will begin to have trouble recognizing faces and will be unable to care for themselves. Alzheimer’s is a brain disease that progresses over time and affects both memory and cognitive abilities, including both thinking and speech. In fact, alzheimer’s can be thought of as a specific form of dementia. Dementia’s most common cause is alzheimer’s disease, which is thought to cause 50-70% of all cases of dementia. Dementia is also commonly caused by vascular dementia, which is usually brought on by a stroke. It can also be caused by Lewy Body disease, frontotemporal dementia, Creutzfeld-Jakob disease, Parkinson’s and Huntington’s. Repetitive head injuries can also cause dementia. Alzheimer’s disease, however, has no known cause. The prognosis of dementia varies widely with each type. Certain forms of dementia are only temporary or can be treated and even reversed (although this is rare). For example, if dementia is due to drugs, tumours or hypoglycemia, it can be managed with medication. Dementia that is caused by alzheimer’s can also be managed. Other types of dementia may have a prognosis of up to 10 years or slightly greater. Alzheimer’s, however, is degenerative and currently does not have a cure. It can, however, be managed for some time with medication. For people older than 80 years old, alzheimer’s can lead to death in as little as three years. However, the prognosis is much longer for those who have early onset. Generally, it is not actually alzheimer’s that cases death – it is complications that arise, like bed sores, infections or pneumonia, for example. Although dementia and alzheimer’s are different, both can benefit from outside care. If you or your loved ones are suffering with dementia or alzheimer’s, know that support is available. C-Care offers a variety of affordable, high quality and personalized services for you to choose from. You will feel at peace knowing you or your loved ones are given the best possible care. Contact us today for more.